Material: Optic Crystal Pedestal, Optic Crystal Apple. 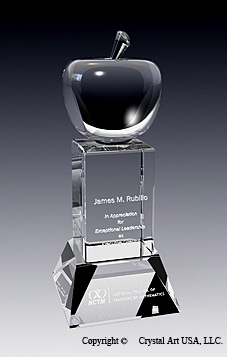 This impressive apple award is composed of a clear crystal apple and an optic crystal pedestal. Each apple is hand crafted by a glass artist. Then we permanently fuse the apple on the crystal pedestal. Personalization is etched on the crystal base. We recommend up to 10 lines, 20-30 characters per line.